Okay, so first off, holy moly you guys are seriously the best. I am blown away by all the comments I received on my post from yesterday. I am not speechless often, but right now, I am speechless. Thank you for just being you. I wasn’t expecting anything when I typed up that post last night. I just felt like I owed you guys an explanation. Comments across blogs are at an all time low, so I guess I just didn’t even think that anyone would comment. I woke up this morning to so much support in my comments section and on facebook. I was taken aback by all the love. I’ll admit, I did get choked up a little. Thank you thank you. Today reminded me that you guys are what’s important to me. Nothing else matters but you. Okay, sappy time over and out. We made a subtle change to the columns in the kitchen that just made the entire ensemble look so much more crisp and professional. Can you spot the differences? Keep in mind this “after” picture is before all the final painting of the walls and baseboards. Now do you see them? We left the far left column alone but we built out the center column and right column so they are square to the counter instead of a weird triangle angle. Do you see it now? The column on the far right now wraps around the sink wall and has a recess on the bottom right that used to not be there. 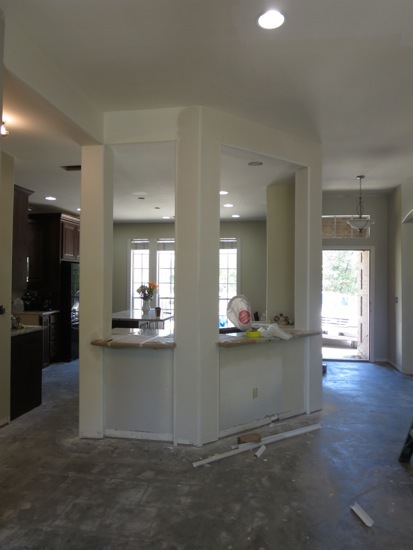 It just looked strange before not having that column bump out, so we created a faux bump out. 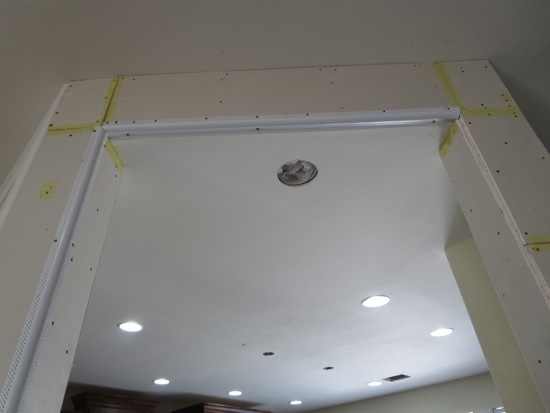 We also un-bumped the center column at the ceiling so it would match the section of wall on the left. I know, I know, so confusing! I did all the bumping out and squaring off of the columns using various sized pieces of wood; mainly 2x6s, 2x4s, and 1/2x1s. It involved a lot of math and measuring and both hands, so I didn’t take any photos of the ordeal. Once the wood was in place the sheetrock guy finished everything off. 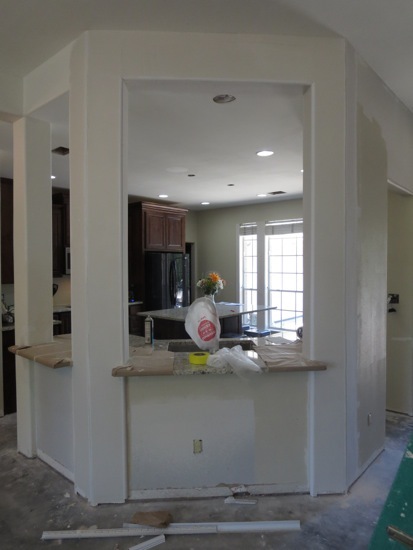 We had to wait until the counters went in before the final taping and floating and texturing could be finished, so once the counters were installed the sheetrock guy finished it all up. Making progress… it’s starting to look like it’s original to the house. Once all the rounded corners were finished as well as the taping and floating, he finished it all off with texture. 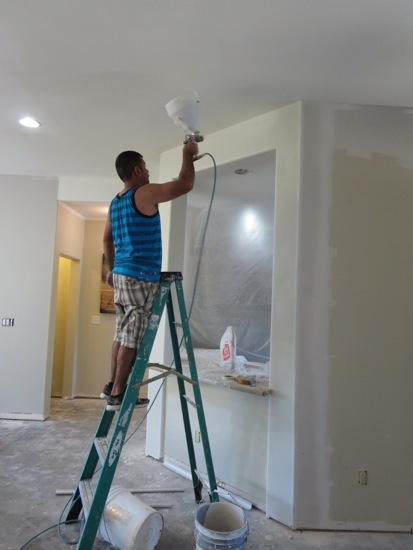 In case you are going to be texturing your walls any time soon, the tool he is using is called a hopper. You hook it up to an air compressor. Ah, looking so much better! The final step was adding the baseboards, which need to be painted white. Spoiler alert: I already painted them and showing you guys is on my immediate to-do list. 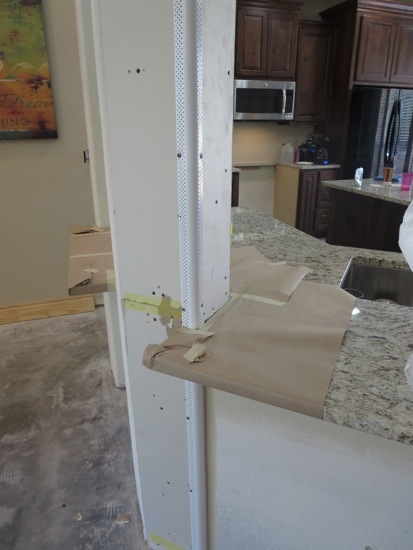 We also cut the bar height counter down to counter height to open the kitchen up more and make it feel more open to the family room. 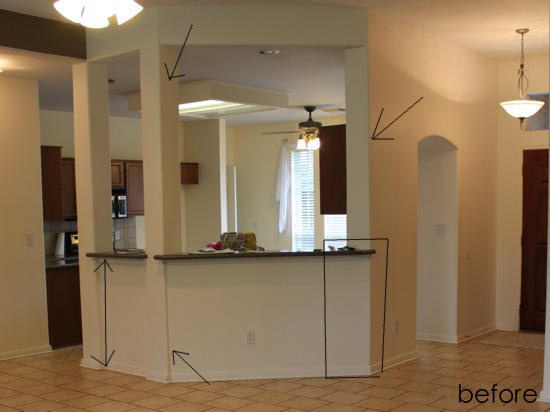 Oh, and one more thing before I forget, the entry into the kitchen on the far right used to be an arched tunnel that we ripped out and squared off. And now, faux columns that look like they’ve been there this house’s entire life. Like I said, very subtle but it just finishes off the space and makes it look a whole lot crisper and more professional. « New kitchen hardware. Oh, and I’m back! 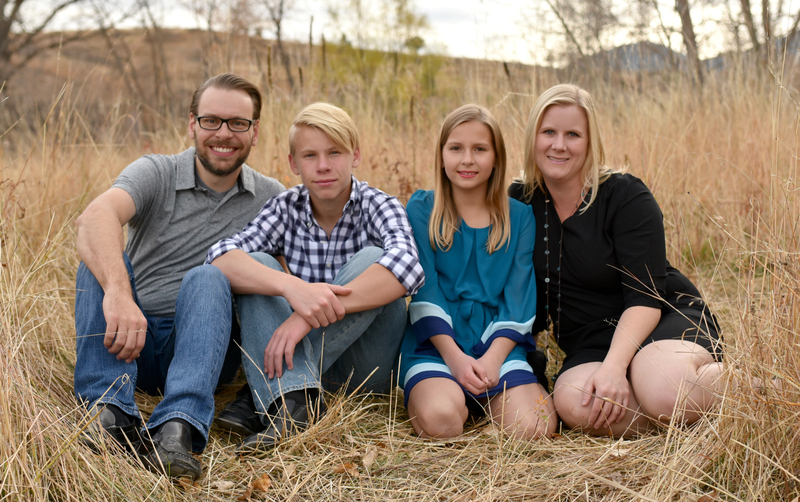 I didn’t get to read your blog from yesterday until tonight–and all I can say is “AMEN!” I do not blog but my daughter introduced me to them about six years ago. I feel in love with the projects and ideas from other homemakers I could actually do with my husband in our home. Budget you know. My daughter and I would call each other when we found a blog post we especially loved. She in Texas, me in Wisconsin at the time. It was so much fun. Then exactly what you stated happened–Big Time. I still love to look at blogs–but it isn’t as much fun because it is so competitive and so out of my budget world. The photos are beautiful–magazine quality–but not what I could ever recreate. Not that anything is wrong with any of them–just not real for me. Thank you for saying it outloud and sticking up for what you believe. Sandy, good way to put it… “big time!” Yup, so true. So much competition. I just don’t like it. I mean, if that is your cup of tea, good for you, but I am just not a competitive person. I’m glad you’ve stuck around and enjoy reading the blog. I really appreciate your support! As for the columns, it’s such a subtle change, but squaring them off seemed so obvious. I still wonder why the original builder didn’t do it that way from the start. The house was built in 2001 so it’s not super old or anything. Hey Allison. I got busy and forgot to comment on your last post, but I just wanted to say I’m so glad you are back. I’ve followed your blog for several years now and I always loved it because it was “real” and “relatable”. Every once in awhile I stop following a blog if I’m just not feeling it and just last week I searched for your blog thinking I had possibly deleted it in one of those moments. Then I realized you hadn’t posted in a few months, not that I had stopped following. And then here you are! You’re back! I tend to gravitate nowadays to blogs that are more real, more like my real life, without staging and expensive items. Just wanted to say I’m glad I get to keep reading your blog and I hope you keep writing and stay true to yourself. I am so glad to be back. It really took me taking 2.5 months completely off to get my mojo back. I was gone long enough to start missing it again, and to really figure out what I liked and didn’t like about blogging. And now, here I am. 🙂 Carrie, thanks for taking the time to stop by and comment. It means a lot to me. Have a wonderful 2015! I’m glad you feel better, but I’m even more glad you’re back! I could not spot the difference until you pointed it out, but it makes a huge difference. It looks so crisp and finished now. I like the doorway change. Unless a design feature like that (arch) is repeated throughout a home, it looks a bit out of place. 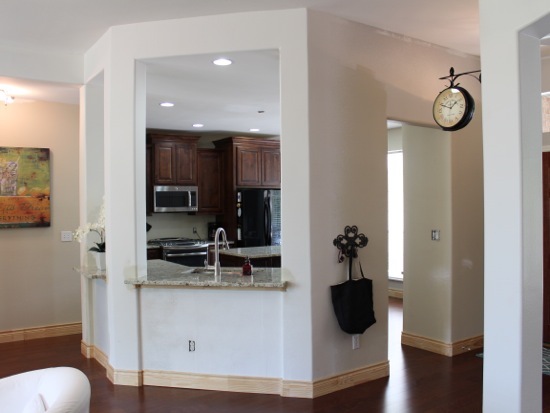 I’d like to lower the bar height in our kitchen, too. I hate sitting on high stools (I’m short), and I think it’s so much more kid-friendly to have the lower bar. Great looking kitchen! Cindy, the only other arches we have are into the dining room, so the arch in the kitchen was kinda weird. Also, you can’t tell from the pictures (I’ll have to do an update and show from another angle) but the arch was more like a 4′ long arched tunnel that you had to walk through. It was very claustrophobic. 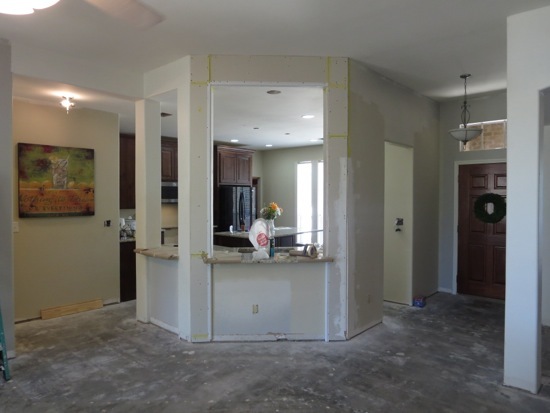 When we removed the arch we were able to make the doorway section a normal wall thickness, and then it just goes straight up to the 9′ ceilings after that, so when you walk in it is very open now and not like you are traveling through a cave to get into the kitchen. I promise, I’ll show some pictures, probably the next post I write. Took me while to spot the difference! I was chuckling about the arched doorway. I love love love arches so I would have left it!! Lori, I commented to Cindy above, but in case you don’t see it I am going to past it here again for you. You can’t tell from the pictures (I’ll have to do an update and show from another angle) but the arch was more like a 4′ long arched tunnel that you had to walk through. It was very claustrophobic. 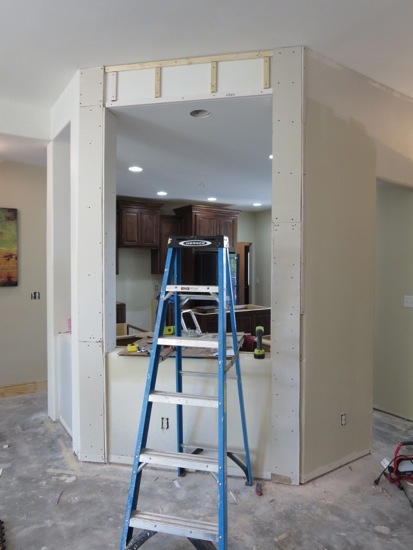 When we removed the arch we were able to make the doorway section a normal wall thickness, and then it just goes straight up to the 9′ ceilings after that, so when you walk in it is very open now and not like you are traveling through a cave to get into the kitchen. I promise, I’ll show some pictures, probably the next post I write. Your blog is one of my favorites because you always give me practical tips that I might use without the sales pitch or “giveaway” stuff. I like knowing how to paint behind a toilet tank, how to make a shelf sit flush against the wall, how to paint my knife block….and I was really disappointed when you took your break. So glad you’re back! Remember, there are many of us who read blogs for the ideas, inspiration, tips, not for the advertising or phony product pitches. I honestly do not even look at the ads running on the sides of blogs, my mind ignores them. Keep doing what you’re doing! There IS a need for it! Hugs to you. Thanks so much Gigi! You are so sweet and I appreciate your kind words. I can’t get wrapped up in all that extra stuff anymore, I need to just continue to focus on your guys and that I’m here for y’all, not for all the other garbage. Hugs to you too! Molly, keep the comments coming! I really love the interaction. I will try this year to branch away from all the fixer upper crap this house needs and do a craft here and there for all my non homeowner friends. When I lived in an apartment when I started the blog, all I did were little projects because I too was a renter. I do miss all the fun little crafts. One reason I got away from the crafts also is because I started to feel like I had too much crap in my house, and I don’t like to make crafts unless they are useful to me and something that I actually want to use. I’ve been trying to get rid of stuff lately, and doing a craft means bringing more decor back into the house. First world problem, I know. I should stop complaining. 😉 Anyway, I know a lot of my readers rent so I will try to do stuff that would work for you guys as well. Oh, and I also like posting recipes so I want to do a few of those this year if I can get my act together in the kitchen ie: clean the counters off before starting a meal so I can take pictures along the way. we had a weird column/island issue in our house too but our problem was opposite. 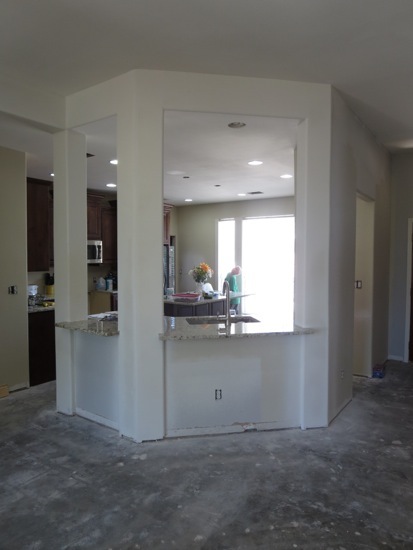 The columns had too much of a bump out so we took a foot or so off to open up the kitchen and it worked wonders. We also cut down our bar height shelf to counter height making it all more even. I love the way it turned out and I think yours turned out amazing as well. It’s funny the simple little changes we can make that really change the character of a room! Well done! I agree, they are such small changes that aren’t that noticeable, but make such a huge difference. Squaring off the columns also made it much easier to get the counters in. The triangle columns would have been a nightmare for the granite guy. Oh, and I totally want to come see your house! I know you have been a renovating fool over there. You should drive out here and see our place too. Well, since you’re posting 2 days in a row, I will comment 2 days in a row. 🙂 Looks great! It’s funny how trim really does give a custom look. We just trimmed all of our windows and added crown and I can’t believe the difference it makes. I love trim work. We are going to put crown around the top of each of these columns eventually and around the entire room. Can’t wait! Hi Allison and welcome back. I am happy you decided to return and I appreciate your taking the time to explain your absence. I have been blogging for only 2 1/2 years and often feel like I am an outsider looking in on an elite club I won’t ever fit into. I took some time off a few weeks ago to spruce up by blog and to think about whether or not to continue blogging. Your post was tremendously influential in my decision to stick with it. I am a real woman in the real world. I don’t own a home nor do I wish to. I rent a small house and would love to move to something even smaller. I know this runs contrary to many people’s desire but I am sure I am not alone. I don’t have a perfectly staged living room. I don’t even have a laundry room. But I would love to think that there are people out there is blog land who are in my position and would like tips from someone living their same lifestyle. Don’t we get enough of the picture perfect room photos from glossy mags? Reading many of the comments from yesterday’s post leads me to believe the answer is yes. So… I will keep working at blogging, taking nice pictures and improving as I go. But I won’t obsess or compare myself to other bloggers or feel I lack anything. So once again, welcome back Allison and keep up the great work. After all, if you were not blogging how would I have known how to make faux pinch pleats for my curtains? I love it! Squaring everything off makes all the difference. Holy cow, when you get a crown on top of it all… WOW. I couldn’t leave a comment on yesterday’s post but I am so excited to see you back!!! I love your posts for their real life practicality. When I want to do something to my house (haha), I see if you have anything on that subject. HOH has all the GOOD STUFF. I’m excited to get more of your ideas! (Especially when they save me as much $$$ as my electrical conduit curtain rods have ; ) ) Thanks, Allison! Oh…and those kitchen cabinet knobs with your name? SO COOL. I read your blog yesterday and today. I didn’t get a chance to say anything yesterday, but today I am MAKING time! I really enjoy your blog and like it just the way it is. I’ve been in some other blogs and I really don’t like how they are doing them. I like someone who is “down-to-earth” and explains well and tells about the goofs and the fixes! If I wanted to get a magazine type review on something I would go to the magazine! I appreciate how you explain things and show your pictures. Please continue to do your “real life” posts. I believe they are much better than the others! 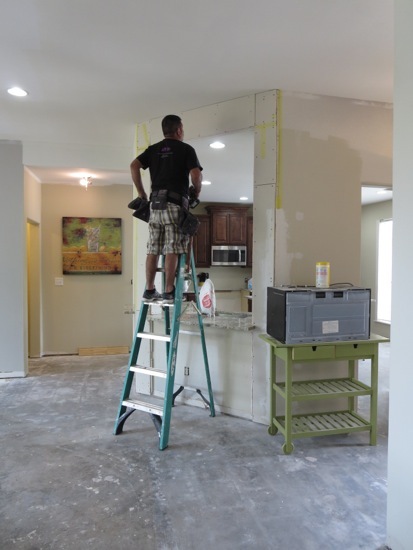 We all live in our homes and want to see how others deal with living in their homes during a DIY project! 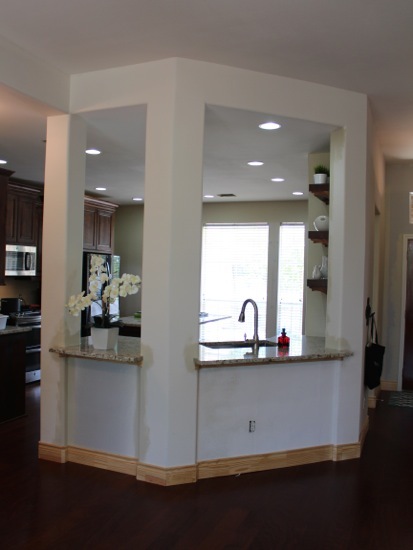 I must compliment you on how well you managed through a whole kitchen renovation! I would have torn my hair out and probably checked into a hotel or the loony bin! Thank you for your honesty and for coming back on line. You have many supporters and I believe you will have them for a very long time. Happy New Year! Looking forward to another year of your blogging! Allison, I love your blog just the way it is. I echo the comments from the others–you are the real thing! Don’t change your style as you represent most of us in the real world. I’m glad you’re back! Its so pretty! The new baseboards made a huge different too! Great job! Allison- so glad to have you back! I love your no nonsense approach because what you do is reasonable and practical! We have been renovationing a 1928 house for almost 5 years. Your blog inspires me to keep going! I totally agree with taking a break from blogging. I have seriously thought about starting a blog due to all of our renovations but decided that the “drama” in the blogging world is just not something that I am willing to take on at this time. So I will continue to follow others and be inspired! Happy to have you back! I hadn’t checked in so long because the posts just stopped. Glad to see you are back. I also like blogs that are real. I just don’t relate to the blogs that appear to be perfect. You’ll probably cringe, but when I think of your blog I often think of the picture of your bedroom with boxes piled everywhere because you didn’t have to post that and that is real! I have four kids so a mess somewhere is just a reality. I also think about the Dave Ramsey post and your thoughts on becoming debt free and living within your means. Refreshing. Please continue to post real everyday pictures, thoughts, and ideas. Also, if BHG ever calls to profile you please don’t let them change things like your furniture or light fixtures. Since I have learned that they do this on some shoots, I just can’t look at that magazine or bloggers who have participated in that the same way. I thought you were just busy and have no time because of the holidays. I think even people don’t leave comment but still enjoy your blog. I am one of them, just lazy to write. Sorry. So happy you are back!! And amen sister about all the sponsored posts lately on many of my favorite blogs. yuck. Makes me want to stop reading. I love your stuff though and as a fellow Texas gal, I’m excited to see you post more! Happy New Year! 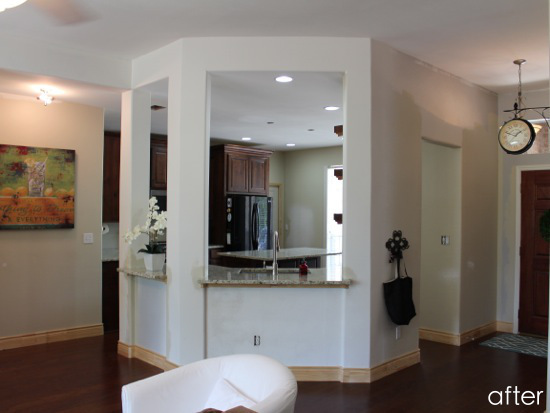 It all looks awesome but I’m drooling over those baseboards! Looking at the ‘before’ picture, I figured it was a very nice peek into a lovely kitchen. But, whoa! The ‘after’ is amazing. Way to go, Allison! It must be a “5 yr blog thing”. I just wrote a post this past week on “Stepping Back” and it has to do with all the same things you mentioned. Here’s to blogging for fun again!! !